Any two terminal linear circuit can be replaced by an equivalent circuit consisting of a voltage source (VTh) and a series impedance (ZTh). In other words, Thévenin's Theorem allows one to replace a complicated circuit with a simple equivalent circuit containing only a voltage source and a series connected impedance. The theorem is very important from both theoretical and practical viewpoints. It is important to note that the Thévenin equivalent circuit provides equivalence at the terminals only. Obviously, the internal structure of the original circuit and the Thévenin equivalent may be quite different. 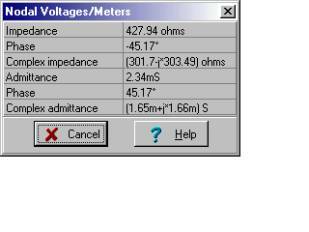 And for AC circuits, where impedance is frequency dependent, the equivalence is valid at one frequency only. · we want to concentrate on a specific portion of a circuit. The rest of the circuit can be replaced by a simple Thévenin equivalent. · we have to study the circuit with different load values at the terminals. Using the Thévenin equivalent we can avoid having to analyze the complex original circuit each time. 1. Calculate ZTh. Set all sources to zero (replace voltage sources by short circuits and current sources by open circuits) and then find the total impedance between the two terminals. 2. Calculate VTh. Find the open circuit voltage between the terminals. Norton's Theorem, already presented for DC circuits, can also be used in AC circuits. Norton's Theorem applied to AC circuits states that the network can be replaced by a current source in parallel with an impedance. 2. Calculate ITh. Find the short circuit current between the terminals. Now let's see some simple examples. Find the Thévenin equivalent of the network for the points A and B at a frequency: f = 1 kHz, vS(t) = 10 cosw×t V.
Note that in the listing above we used a function "replus.' Replus solves for the parallel equivalent of two impedances; i.e., it finds the product over the sum of the two parallel impedances. Find the Norton equivalent of the circuit in Example 1.
f = 1 kHz, vS(t) = 10 cosw×t V.
In this circuit, the load is the series-connected RL and CL. These load components are not part of the circuit whose equivalent we are seeking. Find the current in the load using the Norton equivalent of the circuit. v4(t) = 15 cos (wt+45°) V; v5(t) = 25 cos (wt+50°) V; f = 1 kHz. 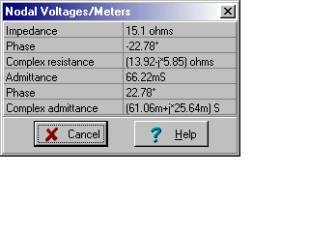 First find the open circuit equivalent impedance Zeq by hand (without the load). 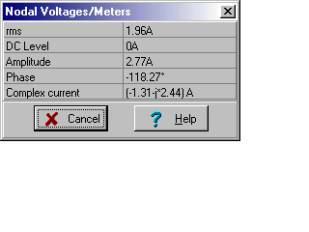 ZN = Zeq = (13.93 - j5.85) ohm. Below we see TINA's solution. Note that we replaced all the voltage sources with short circuits before we used the meter. The calculation of the short-circuit current is quite complicated. Hint: this would be a good time to use Superposition. An approach would be to find the load current (in rectangular form) for each voltage source taken one at a time. Then sum the five partial results to get the total.